poseidon adventure meets aliens, this is a pretty goofy and dumb b movie with bad special effects and lousy dialogue. 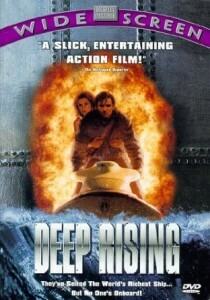 Deep Rising was never meant as something to be taken seriously. it’s a ridiculousy silly movie about a giant sea monster on board an ocean liner. the movie knows what it is and goes for the campy humor whenever it can, but unfortunately that humor isn’t really funny here. campy humor takes skill, just like anything else, which is why someone who is good at it like sam raimi, has a sort of niche. in this movie, the characters utter lousy dialogue and the monster looks incredibly computer graphics-fake. still, the plot tries hard enough to keep our attention that it somewhat succeeds, and there are things that actually do work here, from the secret mission the mercenaries are on, to the mystery about who sabotaged the electronics on the ship. even the monster reveal at the end is okay (certainly better than any monster shots that came before it.) this is not a good movie at all, but at least it has a few merits. Deep Rising is a very dated monster movie. it comes from a time where special effects were somewhere between practical makeup / robotronic creatures, and computer generated drawings. a movie like this isn’t about story or characters. it’s about the monster. the effects here are all computerized and computer effects were at their very first stages when this movie came out, so that if a film was going to go full computers, like this movie did, then the result was not very pretty. the monstrous tentacles that chase after our heroes throughout the film look like a bad drawing of octopus arms. it’s a laughable movie, but at least it seems to know how silly it is and be okay with that. the movie is about a three person team of sailors who drive a motorboat out on missions for whoever is willing to pay them. their credo is “if the money’s there, we just don’t care.” in other words, they ask no questions and lease their services to whoever is willing to pay. the leader of this team is john finnegan, played by treat williams. this might be williams’ only theatrical starring role. he’s a b movie actor if ever there was one, and most movies he stars in are direct to video or made for tv films, such as the substitute 2 and 3. my favorite film with williams in it is things to do in denver when you’re dead, and he was also pretty good as the villain in the devil’s own, but he was hardly the star of either one of those movies. here, williams leads his team on the boat as they transport a group of mercenaries, who are traveling with torpedos, to an undisclosed location. the mercenary team is filled with recognizable actors and grunts, including djimon honshu and jason fleming. the dialogue these guys utter is truly terrible, as if no thought went into it at all and they are just sputtering out the usual cliches, no matter how ridiculous they sounded. while we see these guys on their secret mission, where we don’t know where they are going or what they are planning to do once they get there, we also start watching scenes on board an ocean liner where an attractive seductress, named trillian (famke jansen), is pick-pocketing everyone she comes across, including the captain of the ship. trillian is caught by the captain and the owner of the cruise, simon canton (anthony heald of the silence of the lambs), and she is sent to the brig to stay locked up down in the ice chamber. but then things start to happen. the introductions are over, we know who all the characters are, and so now it’s time to get moving. on board the motorboat, finnegan’s assistant, joey (kevin j. o’connor), goes snooping around and finds the torpedos in the possession of the mercenaries. whatever these guys are up to, it’s big and it’s dangerous. the men catch joey snooping around and proceed to beat him up until finnegan steps in and rescues his little buddy. on board the ocean liner, the electronics are mysteriously disconnected by someone with access, and suddenly the ship loses all power. pretty much right after that, the ship is attacked by something huge and everyone goes running in a panic. people falls off landings, and an asian woman locks herself in the bathroom and sits on the toilet, until something apparently bursts out of it and grabs her. something exactly like this happened in the movie, the relic, with a cop in the bathroom and then something grabbing him, without us ever seeing the monster. theses are the ways that bad movies introduce monsters, apparently, playing by the rule of don’t show the audience any bit of the creature until you are slowly ready to reveal it, bit by bit. that is certainly the philosophy behind this movie, where we spend the entire film thinking the monster is simple these giant tentacles, and only learn at the end that there is something more. i like the final images of the creature, but up until that point it was a pretty lousy monster composed merely of tentacles with mouths at the ends. our characters spend the movie either shooting at them or running away. one look at the team of mercenaries on the boat in the opening scenes and you know that the movie will be about watching these guys get picked off one at a time. that’s another very simple approach, but one thing i do like is that by the time our main characters get onto the cruise ship, all of the guests and partygoers are long dead. this is like event horizon, walking into a place where clearly something terrible happened and finding nothing but corpses. there is some humor sprinkled around throughout the movie, but none of it is very worthwhile. kevin j. o’connor is the court jester comic of the movie, and he’s also the punching bag. unfortunately, he isn’t very funny at all. this is the freshman effort from director stephen summers, who went on to make all of the mummy movies afterwards (and brought o’connor along to be the comic releif in those films as well.) summers does what he can with the limited story and effects, but this is certainly not a good film. 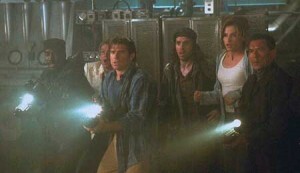 Deep Rising wants to use every monster movie cliche in the book and put them all together into one. the team of mercenaries is like the marines team from aliens, and the giant monster is like that of about a thousand movies that came before this one. it’s funny that this movie came out in 1998, one year after both the relic and event horizon were in theaters, because Deep Rising basically is a combination of those two films. as it happens, it is about ten times worse than either one. i used to think this was a fun, but bad b movie. now i realize, it’s just dumb and bad. the effects might have been okay back then, but when you look at them now, they are truly awful. if there’s one thing that’s halfway decent about the movie, maybe it’s the story about these guys going out their to the ocean liner, and how they don’t know what the mercenaries are up to. other than that, the movie is a pretty big waste.